For all of you Angelic Organic shareholders, you don’t need me to recommend this one! Last season, all shareholders received a copy of Farmer John’s Cookbook: The Real Dirt on Vegetables. 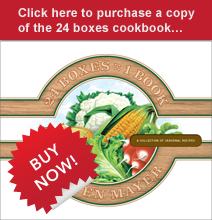 It’s a great resource for information on storing and cooking the vegetables that grow on the Angelic Organic farm as well as a wealth of seasonal recipes organized by vegetable and growing season. But more importantly, it’s a book with stories and anecdotes that give you insight into the people and the process that gets your box of veggies from the ground to your home every week. I’m not usually a fan of veggie burgers, but this week’s newsletter mentioned a “beet burger” recipe in Farmer John’s cookbook and I was intrigued. 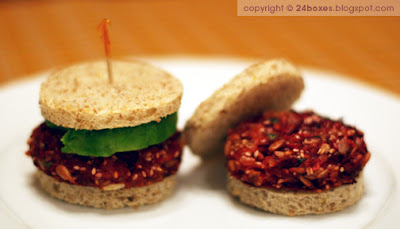 This recipe is my kind of veggie burger – it’s actually made out of vegetables! And there’s some sunflowers and sesame seeds thrown in for texture and protein. I strayed a bit from the original recipe in the book, but overall it’s a great vegetarian recipe with a lot of flavor and a lot of room for experimentation with toppings and add-ins (shown here with mayonnaise and avocado). Next time I make them, I’m going to try using smoked cheddar cheese to add another flavor dimension and give the burgers more of a barbequed, “meaty” flavor. I shaped my burgers into smaller patties (2.5” in diameter) and ended up with 18 burgers. But the smaller patties require smaller buns, so I used a 2.5” circle cutter to cut out whole wheat bread rounds and toasted them. If you stick with the original recipe, you can use standard regular or whole wheat buns. The smaller patties cooked for the same amount of time – 20 minutes. I added 1 teaspoon of kosher salt to the recipe (1/2 teaspoon if you’re using table salt) and sprinkled the patties with additional salt and a crack of fresh pepper before they went into the oven. I whisked together the eggs, oil, flour, soy sauce, garlic, cayenne pepper and salt to make a sauce, which I then worked into the other ingredients. It made mixing easier and ensured that all of the flavors of the sauce were evenly distributed. And one last tip: I wore disposable kitchen gloves while mixing and forming the patties. They’re indispensable when working with beets but are also helpful to have in the kitchen for other messy jobs or if you’re working with raw meat and chicken. You can find them at any kitchen and restaurant supply store. You realise that using disposable kitchen gloves gives you a thumbs down? all that plastic down the drain after one use! I'm sure you can do better than that given your commitment to a better way of life! think it through! what's wrong with a bit of water and soap?